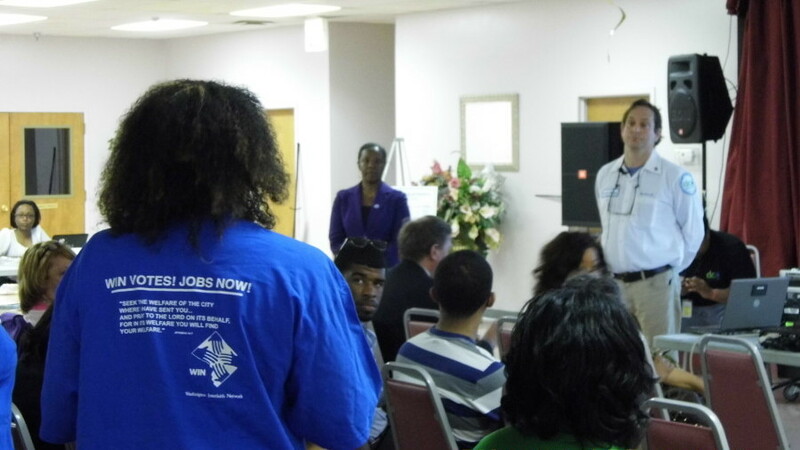 On Tuesday, 30+ WIN leaders turned out at the DC Water Ward 8 Town Hall meeting to ask DC Water GM George Hawkins to commit to a pathway to jobs for DC residents. Even more leaders turned up to the Ward 4 Town Hall on Thursday, establishing a strong tone in the lead up to April 22nd. The water bills of DC residents will contribute $2.6billion to the Clean Rivers Project, and want a fair shot at the jobs created by the project. WIN leaders did 1 on 1’s with the 30 or so Ward 8 residents in attendance to educate them about DC Water’s track record of local hiring. Ward 8 residents were shocked by a recent DC Water report on hiring by contractors that showed there are more residents of North Carolina working on DC Water projects than wards 7 and 8 combined. Rev. Kelly Wilkins and a team from Covenant Baptist UCC, along with leaders from Paramount Baptist, St. Teresa of Avila, All Souls, Holy Comforter St Cyprian, and other WIN institutions stood up during the Q & A to ask GM Hawkins to commit to hiring DC residents on projects funded by ratepayer money. On both Tuesday and Thursday, GM Hawkins said he would not commit to the jobs pipeline. On Thursday, Rabbi Jessica Oleon joined Rev. Wilkins in bringing the jobs pipeline to the floor. Supported by the crowd of blue shirts behind them, which included leaders from All Souls, Temple Sinai, Mt. Lebanon Baptist Church, Emory UMC, Luther Place, and others from all over the district, Rabbi Oleon and Rev. 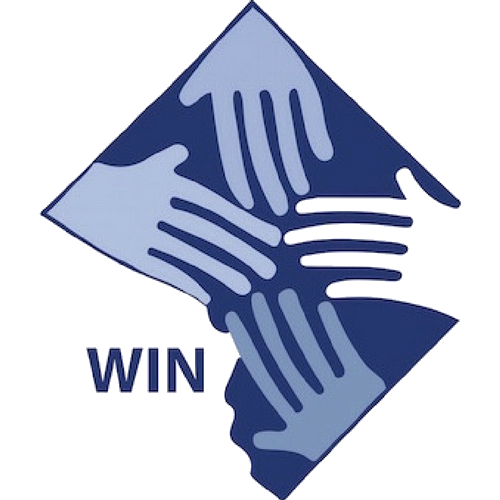 Wilkins had a spirited back and forth with GM Hawkins in front of over 100 attendees, who applauded the idea of DC Jobs being attached to the stormwater infrastructure construction.